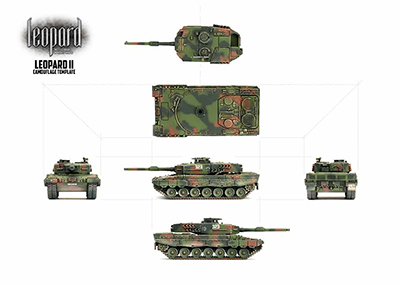 Before the advent of the standard NATO 3 colour camouflage scheme, most of the member nations painted their equipment in different schemes. By the early 1980s the organisation came to a collective conclusion that during war this would make it quite easy for an enemy to identify which army they were up against, therefore conferring a possible advantage in combat. It was determined that a standard camouflage scheme should be developed. After some discussion and trials a paint scheme that consisted of a medium green, a red-tinted brown and a grey-black (which fades from close to black to close to grey) was formally accepted in 1984. This change in scheme also conferred the benefit of taking advantage in advances in paint technology, allowing some infra-red spectrum diffusion and limited protection against chemical warfare agents. West Germany was the first NATO nation to start applying the scheme to their vehicles during scheduled refit operations. The paint scheme is generally applied by organisations that are specially equipped to deal with the hazardous properties of the chemically resistant paint. As part of the application process each type of vehicle (or equipment) is painted to a template that has been developed specifically for that vehicle, with a spray gun giving the pattern a soft edged look when viewed from fairly short distances. 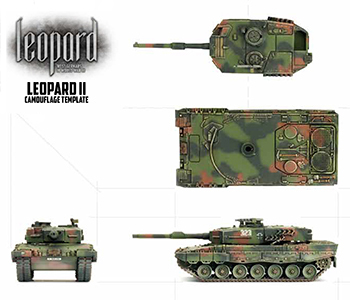 This means that each every vehicle of a particular type (for example Leopard 2) has the same camo scheme applied in the same way. 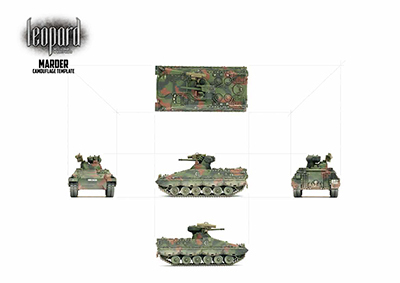 Thanks to a mixture of real life photos and large scale modellers Aaron managed to piece together templates for every vehicle as he painted them for the Studio army. Casey has used our models to take photos from each angle so that you can replicate the patterns. Here you can find PDF versions of our painting templates. This is the High Res version, great for those of you that have tablets or smart phones and want to really zoom in. You can also print this version if you want. 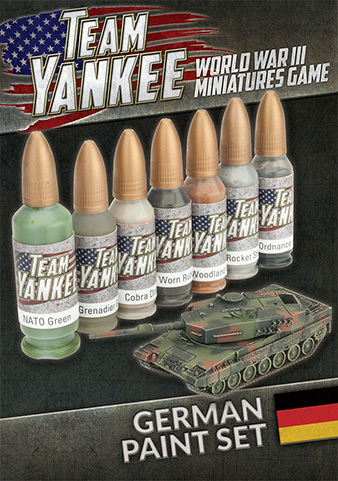 All the colours you need to paint the NATO 3 Colour Camo can be found in the Quartermasters Paint Set and the Team Yankee German Paint Set.